We are constantly developing new themes for your kiosks. In order to create a solid brand experience in your store, you might want to give your kiosks a special look. Set up a custom theme so your customers take in-store kiosks as a seamless extension of your brand. 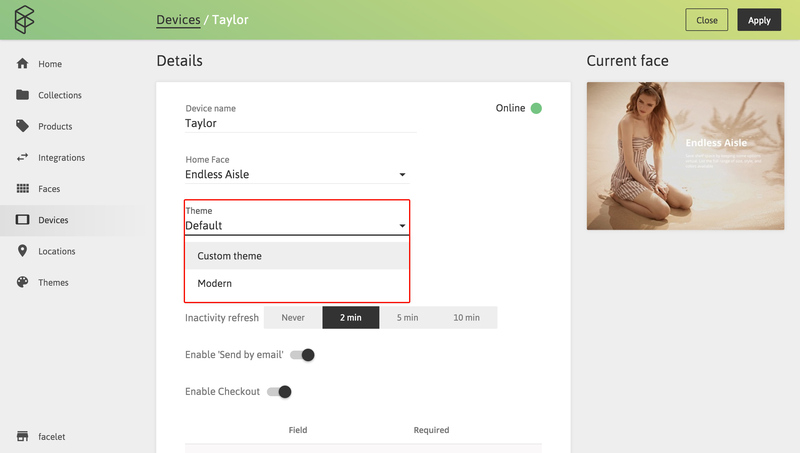 When you create a new custom theme there are already some default options. Choose fonts, colors and layout options that fit most your brand identity. Choose one of 1000+ font families available for your text and headings. We are constantly working on adding even more fonts to the library. Headings option will affect headings of Cover, Text, Gallery, Collection and Product widgets. It will also be used for price tags in Collection, Hotspot and Product widgets. Text option will be used for the rest of the text on your kiosks. Light text and Dark text color options are common for all your screens and will be used automatically throughout the kiosks. Dark text will be used on light backgrounds, Light text—on dark ones. 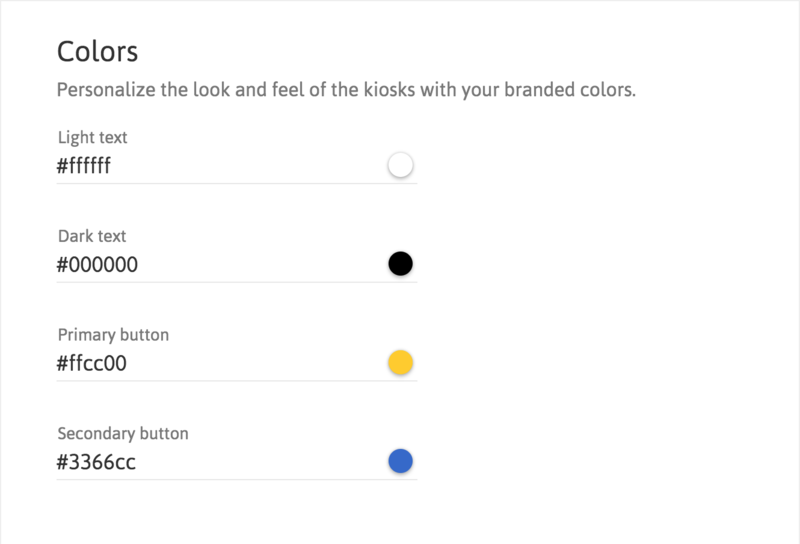 Primary button color will be used for your primary calls to action, such as 'Add to cart' and 'Checkout' buttons. Secondary button color option is used for secondary calls to action. Sending product details by email button is one of them. 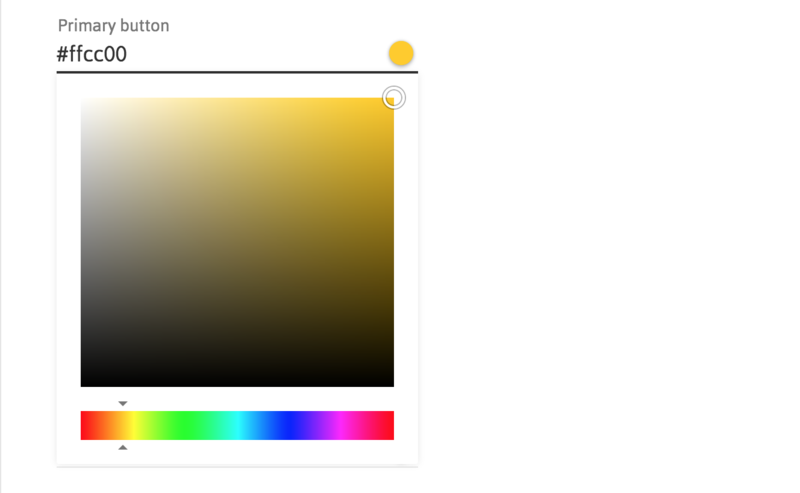 You may set the color by either entering it's HEX code or by choosing it with a color picker. 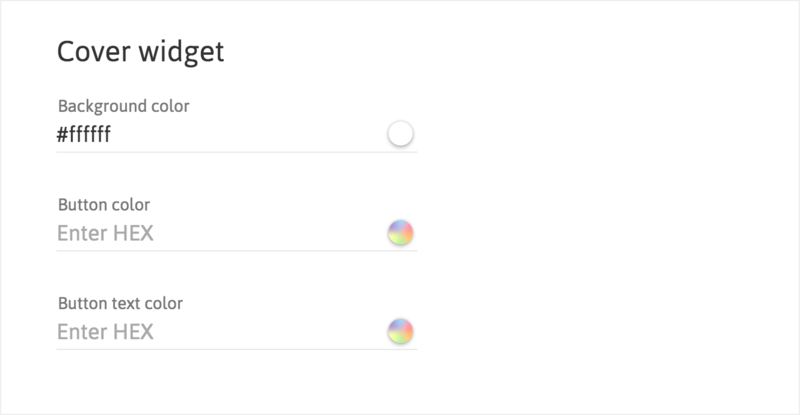 Click a coloured round button near the input for a color picker to show off. Rounded corners toggle corresponds for your buttons style—either they are rectangle or rounded. Outline/Filled option will make you Cover widget buttons either outlined or solid respectively. Choose a background color for your text widget in order to make some accent on your narrative. If your cover image is smaller than a text block or you use a *.png image with transparency, you might want to set a different Background color for your Cover widget. If not set, button background and text color will be set to Dark text or Light text depending on widget settings. If you want a special buttons decoration for Cover widgets, you may set specific colors for Button color and Button text color options. Choose a Background color for your gallery for more contrast. You may choose layouts for your Collection widget. With a Grid layout your products will be displayed in a uniform grid, while a Modern layout will build a more sophisticated mosaics. For a carousel view you can choose between a full-screen or a half-screen size carousel. Choose a Large or Small size respectively. Choose an Icon color for a clickable dot for your Hotspot widgets. Try to keep it contrast to your images. 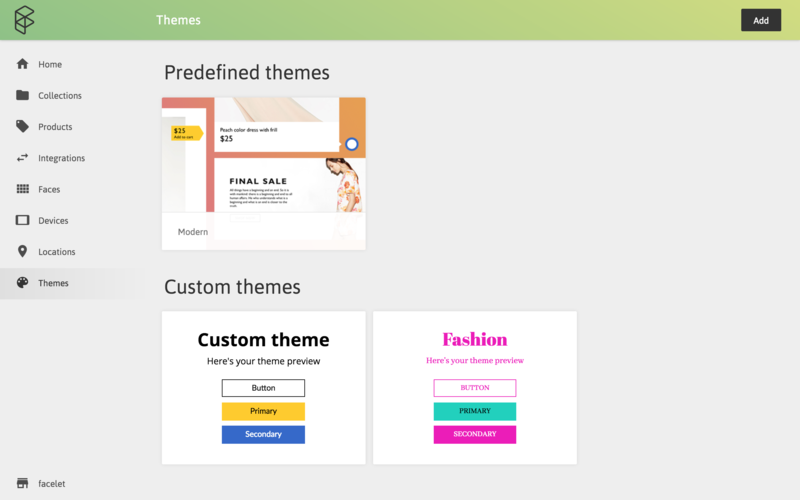 After you finish setting up your custom theme you can preview it before publishing. Click a Preview… button in the top right corner and choose an active Device for a preview. You will see a demo content with a set of all types of widgets in order to see your theme in full. You can publish your theme by clicking Save. Now go to your Device settings and choose a theme you've just created.